"Custom Doll Contest" organized by Groove Inc.
To commemorate the 15th anniversary of Pullip, a custom doll contest will be held during the upcoming "Fashion Doll Pullip 15th Anniversary ~ Dream of the Starry Sky ~ at Yokahoma Doll Museum the special exhibition opens on April 21st. We are looking world-wide for entrants for our custom doll contest and look forward to seeing everyone's entries! Dolls that are submitted will be displayed at the exhibit and many fans of Pullip will be able to see them. The Grand Prix prize of the contest is that the winner's doll will be commercialized and made into a doll release! ·: *: ·. , ☆ ゜ '·: *: ·. ,,. ·: *: · ゜ '☆,. ·: *: · ☆ ゜ '·: *: ·. , ☆ ゜ '·: *: ·. ,,.·: *: ·. , ☆ ゜ '·: *: ·. ,,. ·: *: · ゜ '☆,. ·: *: · ☆ ゜ '·: *: ·. , ☆ ゜ '·: *: ·. ,,. 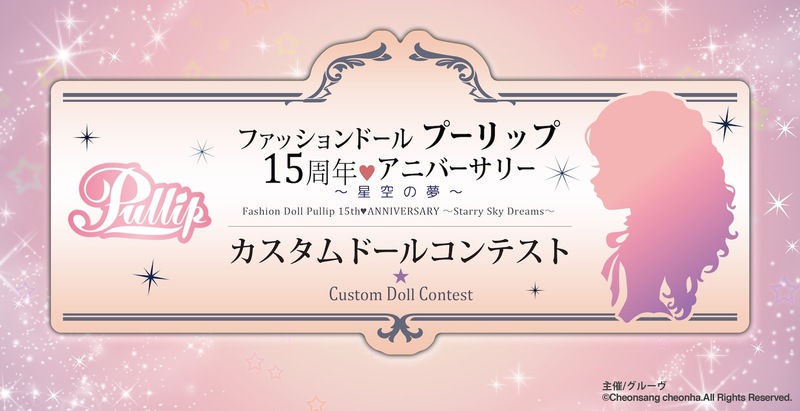 ★ The theme of the custom doll contest is "dream". Please convey your vision of Pullip's wonderful dreams. selection after a fair review. · April 05 (Thu) Deadline for applications acceptance. · May 31 (Thu) Contests Results Announced! If you wish to participate in the Custom Doll Contest, then you must agree with all of the contents of the application guidelines as listed below and according to application method. · Entry works are limited to those not commercialized. · Dolls used in the custom doll contest must be dolls produced by Groove only Pullip, Dal, Taeyang, Byul and Isul are allowable. Changing of the doll's body is not permitted. · Over-makeup is acceptable even if it is not full makeup so long as the custom doll is totally different from the original doll. · Please refrain from making modifications to the doll's face or body such as carving or the addition of sculpted parts. · Please refrain from using other companies' parts (hands, feet, outfit etc.). ※ The use of other company's eye chips, shoes and wigs is permitted. · Since there is a possibility of damage to the submitted work at the time of shipping, please pay attention to careful packing when shipping. · Please refrain from applying for things that may infringe other copyrights such as characters, objects or works that are against public order and morals. · In the event that there is a claim of infringement or a dispute of infringement from a third party in the submitted work, it shall be resolved by the responsibility and burden of the applicant himself. And the organizer of this project, Groove Inc. and Yokohama Doll Museum, the organizer of the exhibition, take no responsibility. · Entrants are free to publish your entries on your own WEB media. At the same time, Grove Inc., the organizer of this project, agrees not to exercise any right claim and right to use the submitted work for introduction / advertisement promotion purposes on our website. · For Grand Prix works, at the same time as adopting commercialization all copyrights are transferred to Groove Inc., the organizer of this project. · The rights when the work is commercialized belongs to Groove Inc. which is the organizer of this project. · The ownership of the submitted works provided to the auction after the contest is transferred to the successful bidder after the end of the auction. · The auction bidding start price of the entry after completion of the contest will be decided by Groove Inc. which is the organizer of this project. · Part of the auction proceeds will be donated to charity. · If you apply to the contest but you do not wish to participate in the auction, we will return the doll after the end of the exhibition. · Dolls that were featured in the auction but failed to receive bid will be returned to the applicants. Please send the following to the application email address.After accepting the application, we will reply to you by February 14th. - Name ※ If you are applying by a name that is not your real name, please also give your real name. The real name will not be disclosed then. * Please contact us if your e-mail address has been changed after your entry. * When making inquiries please specify "About custom doll contest" as of e-mail title. ☆ After the contest, we are planning to auction off the dolls submitted at the site of Groove Inc.
For those who participate in the auction, this is the only chance in the world to get custom doll! Copyright © グルーヴオフィシャルブログ2 All Rights Reserved.